You must have already heard multiple times that the introductory paragraph of almost any piece of writing, be it a college essay or a newspaper article, is important. Why is this so, you might ask? The answer lies in the old and well-known proverb that the first impression is the strongest one. The mission of an introductory paragraph is to catch the reader’s attention, and make them read through the rest of the text with interest. It also includes a crucial part of any piece of writing: a thesis statement or key statement. An introduction also provides background information about the main topic. Hence, knowing how to craft a well-written introduction is an essential skill to obtain. Decide on the scope of the introduction. It may be general at the outset, but narrows down to a thesis statement, or it can be specific from the beginning. Decide on the main points you want to cover in your paper, and list them in the following 3-4 sentences of the introduction; one point per sentence is fine. You may want to restate them so that they do not sound exactly the same as in the text. Compose your thesis statement. Make it as concrete and specific as you can, as it is the main part of the introduction. Double-check everything you have written to make sure you have not missed anything and provided all the necessary background information. There are many efficient attention grabbers, so instead of inventing something new, you can choose one that suits your purposes the most. Intriguing examples, provocative questions, puzzling or absurd statements, even intended generalizations about controversial issues, and many other techniques—they all can help you make your introduction catching and engaging. The middle sentences of your introduction (usually there are 3-4 such sentences) usually cover the points you analyze in your paper. So, you should either clarify these points for yourself before starting to write your paper, or craft the introduction after you already finish the paper and know exactly what it is about. A thesis statement must clearly introduce the main idea of your paper, its core message; it is placed at the end of the introductory paragraph. 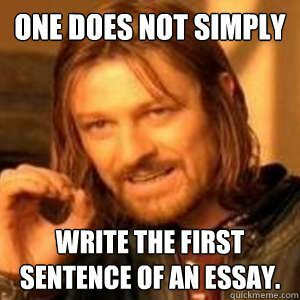 Usually, a thesis statement is covered only in 1-2 sentences. This is the part you should pay the most attention to when writing the introduction, as without a proper thesis statement, neither your readers nor you will have a clear idea of your paper. Start strong. Use attention grabbers—sentences that will make your readers want to read further (for clarification, because of curiosity or a desire to argue with your statement, or due to some other reasons). Keep in mind that it is impossible to satisfy everybody’s interests, so pay attention to the interests of your target audience. Display confidence in what you are going to write about—be straightforward. Dilly-dallying, playing around, and using phrases like “In my humble opinion,” or “I could be mistaken” will definitely make you lose credibility in the eyes of your readers. Introduce background data, quotations by famous people, and other supportive information in the introduction if you need, but try to make it as brief and concise as possible. Remember that delving in explanations has more to do with the main body paragraphs rather than with the introductory part. Appeal to your readers. Though in certain types of writing this technique is inappropriate, still it is an effective method of making your audience more engaged in reading. For example, you can use this technique in persuasive or reflective essays. Announce the purpose of your paper or your own intentions about it. Introductions like: “In this paper, I will discuss mosquitoes” or “My novel will be about people” is unnecessary. Be vague. Lengthy and ample introductions with lots of inter-textual connotations and sophisticated hints may seem like a nice literary technique to you, but in fact they make your readers believe they are reading a textbook instead of an interesting paper. Introduce dictionary or encyclopedia definitions. An introduction must help your readers understand what the paper (or essay, or novel) is going to be about in general; it is a road map, not the road itself. Definitions will definitely be useful further in the text, but in the introduction, they are unnecessary and look unprofessional. Be afraid to change the introduction when you have already written one. Sometimes, when you finish a paper, you will see that the introduction does not fit in with the rest of the paper; in this case, feel free to rewrite the introduction completely, if needed, edit your thesis statement, and make all necessary changes. As an alternative, you might want to write the introduction (except the thesis statement) last. Forget to formulate a concise idea of your writing in a form of a thesis statement. An introduction without a thesis statement is incomplete. Composing an introduction that is too vague or general, which serves no other purpose than matching the word limit. Using dictionary definitions in the introduction. Providing too much content in the introduction, so that instead of simply preparing readers for what is awaiting them, you start to explain your material or give them excessive information. Announcing your intentions about the paper in the introduction.